GBPUSD traders are now waiting for the speech by the Bank of England’s (BoE) Governor, Mark Carney. 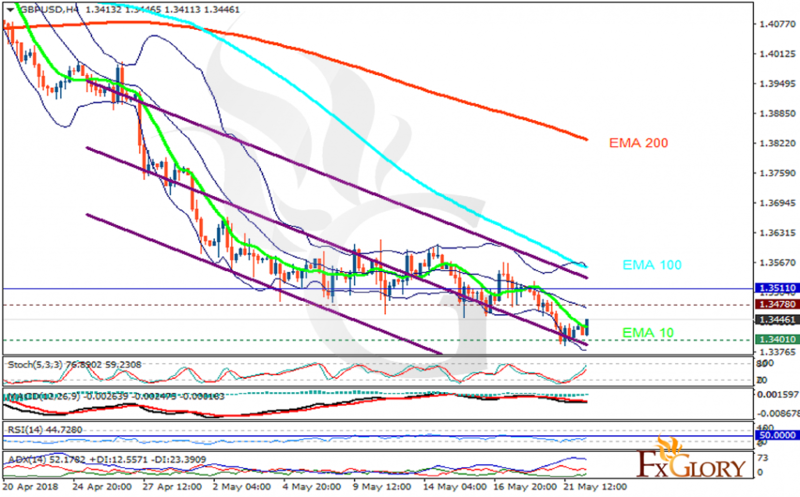 The support rests at 1.34010 with resistance at 1.34780 which both lines are below the weekly pivot point at 1.35110. The EMA of 10 is moving with bearish bias in the descendant channel and it is below the EMA of 200 and the EMA of 100. The RSI is rising towards the 50 level, the Stochastic is showing upward momentum and MACD line is below the signal line in the negative territory. The ADX is showing sell signals. Despite the bulls attempt to control the chart, GBPUSD will be falling down towards 1.33.